Like one of my books free? Get It Now! That's right - all three books! All the Devin you can read. From diamonds and Chinatown, to one of the most evil killers to hit LA, to the biggest Hollywood starlet murdered and the wrong man convicted - it's all here. Go for a great ride through the amazing 1930s - the most dangerous, glittering, low-life time in Los Angeles’ crime filled history. 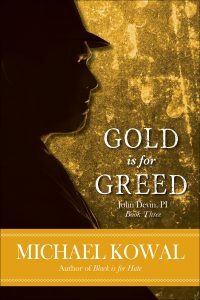 Welcome to Gold is for Greed. It's honestly my best novel yet, and crashes Devin straight into big time Hollywood to clear a guy convicted of murdering one of its most famous starlets. And the guy's execution - is the next day. I had a ball writing Gold - and Bella, Charlie and Detective Cardon are all back, along with the nastiest people in Hollywood. Check below for the full description - but I'm really proud of the book, and look forward to sharing it with you. And click the All Books tab above to find out more information on all of the John Devin, PI novels and short stories, complete with links direct to your favorite retailer. A mother walks into John Devin, PI’s office with one request - clear her son of a murder he didn’t commit, before he’s executed, the next day. And the murder? Only Liliana McGann, the biggest starlet in Hollywood. Used by everyone who could get a piece of her until one of them was done - and killed her. Devin plows through bad cops, organized crime, and the biggest studio in town in a race against the clock, with a guy about to die, to find who actually did it until there’s only one thing sure in the end: Hollywood - will never be the same. 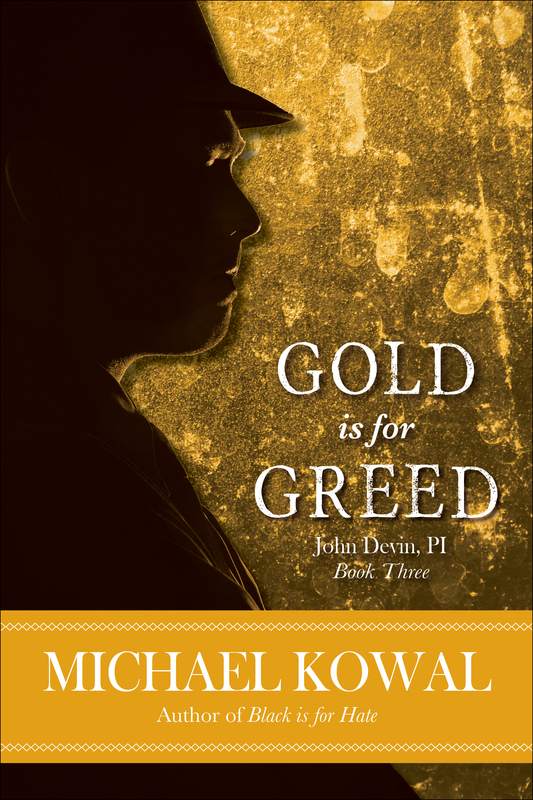 If you like your detectives hard-boiled and with attitude, with a strong sense of right, and characters you want to spend time with, grab Gold is for Greed today. Then join Devin as he solves his way through the amazing 1930s - the most dangerous, glittering, low-life time in Los Angeles’ crime filled history. 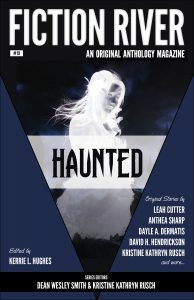 My short story Clean has been published in the Haunted volume of the award winning Fiction River anthology series. A little bit of a departure for me, Clean is a fun story about an older man who's lost his wife, but she comes back to teach him a few things about life - including about how to do the laundry. It was absolutely a riot to write it, and I'm smiling here as I write this update. I think you'll have fun with it. Go to Fiction River to find out more about this fantastic volume, or click here on the Haunted link to go direct to Amazon, Kobo, iBooks, or Barnes & Noble to pick up your copy today. That's two stories I've sold to Fiction River this year, plus I'll have more published there in 2017! New Video - Where Did Devin Come From? One of the top two questions I get - just where in the heck did Devin come from? Black Is For Hate - the second novel in the John Devin, PI mystery series has been officially released on all retailers in ebook (Amazon, Kobo, iBooks, Barnes & Noble), and in paperback. Nothing shocks in 1930s Los Angeles — except five of the most brutal murders the city has ever seen. Five women killed. A city plagued — until Devin enters a world of brutality even he never imagined. Haunted by the shadow of the most brutal chapter of his own life, Devin races to stop the final kill as he wrestles with his past’s never-fulfilled — dark — black — need — for revenge. 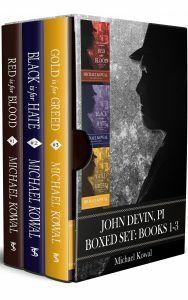 For two weeks starting January 8th, Red Is For Blood will be featured on the Kobo site under Kobo Next - a curated list, meant to present hidden gems that are poised to become the next big thing. Kobo is one of the fastest-growing and largest eBookstores in the world, with more than 4 million titles across 77 languages. This truly global company offers award-winning eReaders and top-ranking apps, and through their Kobo Writing Life program, are huge supporters of indie writers like myself. I can’t be more excited. So if you’d like to find out more about my novel Red Is For Blood - check out Kobo Next starting Friday January 8th (and continuing for two weeks) and scroll down to the Mysteries & Thrillers section. There, you’ll be able to find out about my book - and a great company doing great things for indie writers. 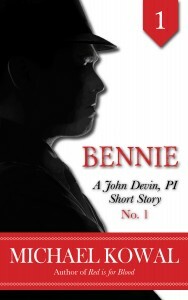 I've also just published the second John Devin, PI short story - Bennie. I love short stories because I can visit a little more with some of my favorite characters and this one, Bennie, first appears in Red Is For Blood - and turns out to be Devin's newest best friend. 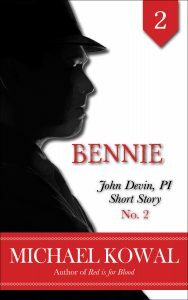 Bennie - A John Devin, PI Short Story… Devin is on a fresh case to recover money and bootleg booze belonging to Toots, the owner of Devin’s favorite LA speakeasy. The money and booze found, he gets a little more than he bargains for. Click All Books above to find more information on Bennie, and all my books, and buy buttons to all your favorite retailers. 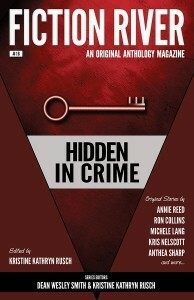 My short story Sunshine has been published in the Hidden In Crime volume of the award winning Fiction River anthology series. Set in 1930s Los Angeles, Sunshine follows PI John Devin as he sets out to find out what happened to all the millions stolen from Little Jackie Sunshine, America's most famous child actor. He doesn't have to go far when his hunch pays off that the thief - is Jackie's mommy dearest. Go to Fiction River to find out more about this fantastic volume, and go to Amazon, Kobo, iBooks and Barnes & Noble to pick up your copy today. Red Is For Blood - the first novel in the John Devin, PI mystery series has been officially released on all retailers in ebook (Amazon, Kobo, iBooks, Barnes & Noble), and in paperback. It's Christmas. 1929. Los Angeles. John Devin, ex-Marine and current PI, sits at his bar stool nursing a whisky and cracked ribs. Then a buddy walks in. Out of the blue. Like fate brought him in. The buddy’s request: keep him alive until he sells a certain diamond. But that diamond leads Devin on a chase through LA that eventually leads to Chinatown and the leader of its underworld, a man with a hidden secret. Sometimes people are brought together for a reason. And sometimes that reason, is to die. If you like your detectives hard-boiled and with attitude, with a strong sense of right, and characters you want to spend time with, grab Red Is For Blood. Then join Devin as he solves his way through the amazing 1930s - the most dangerous, glittering, low-life time in Los Angeles’ crime filled history. Sunshine, the first short story in the John Devin, PI series — and the very first Devin story I wrote, has now been published on Amazon, Kobo, Barnes & Noble, and iBooks. If you like your detectives hard-boiled and with attitude, with a strong sense of right, and characters you want to spend time with, grab a copy of Sunshine. Then join Devin as he solves his way through the amazing 1930s - the most dangerous, glittering, low-life time in Los Angeles’ crime filled history. 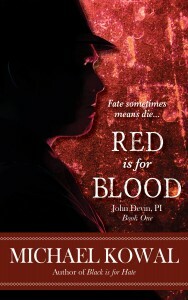 The first novel in the John Devin, PI series - Red is for Blood - is in the final stages of editing, and I'll be publishing it in the next few weeks! I had a ball writing it, and I hope you'll have just as much fun reading it. And want me to let you know when it publishes? Sign up for my VIP List to get a free story, and get on the list to hear about all my new releases.